"Haweeli's art is as provocative and enigmatic as he is." In late 2007, the urge to express, the necessity to create a visual record, came rushing forward into Steve Haweeli's life. The compulsion to paint came with hesitation and fear. He labored in his subterranean studio and told no one. Haweeli's paintings have been a process of excavation — revealing layer upon layer of hidden meaning through the medium of paint. These paintings are informed by his various incarnations - gravedigger, traveler, linguist, actor, seminarian, volunteer, barman, wordsmith and entrepreneur - thus contributing to his particular vision of the mosaic of our experience here; often the symbol of the cross permeates the visual dialog within. These creations express the alchemy of fury and freedom he continues to unearth in himself. The excavation continues. His work successfully debuted at the monthly shows at Karyn Mannix Contemporary (former Hampton Road Gallery) in Southampton as part of the 2009-2010 Artist's Collective. As well, he is a regular contributor to group shows at Ashawagh Hall and Guild Hall in East Hampton. His several solo shows include those at the Outeast Gallery in Montauk, NY, Hamilton College in Clinton, NY and the Donald Gallery in Dobbs Ferry, NY. 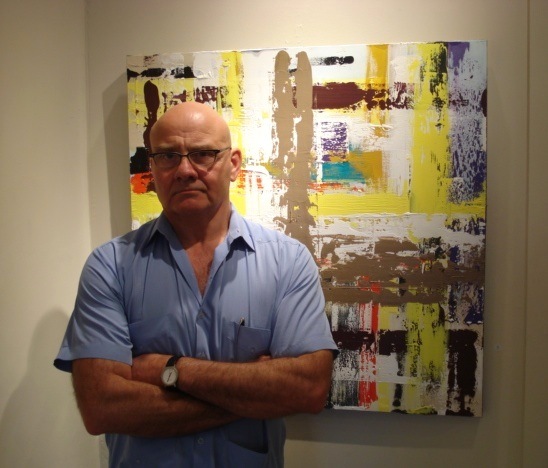 He had a successful Manhattan debut at the Affordable Art Fair New York City in Spring 2012. His works are now part of numerous private collections.